I'm a little late getting this blog posting up... I kind of had to recover from the event. Sam rolled into town in the early afternoon and what a blast! The pre-event agenda was gossip, code names, and assorted gems I will not be sharing. Plus great sushi -- in Whitby, much to my surprise -- and plenty of geek talk. For the event itself we were in a new venue and had to sort out some logistics around projecting and such, but it worked in the end. We had about double our usual attendance. I have never seen so much note-taking! Then when the crowd left, it was time for beer and more discussion, until the dreaded “you don't have to go home, but you can't stay here.” Time for Sam to meet a true Canadian institution... Tim Hortons . Other blog entries on the evening: Eli, Sam, and Jean-Luc. Though I notice Sam neglected to mention that he actually likes C++/CLI . If you're an INETA speaker and you haven't come to my group yet, you don't know the fun you're missing. Just say the word, and I'll request you. And if you live within an hour or two's drive of Oshawa or Whitby, and haven't been to a meeting yet, resolve right now to come to the next one. It may not feature beer, but you'll be glad you came. Back in the 80's, one of the classic anecdotes around corporate gender unfairness was the idea of the meeting that finished up in the mens room, inaccessible to the women left standing in the hall. If this is how those meetings went, we were worried for nothing. 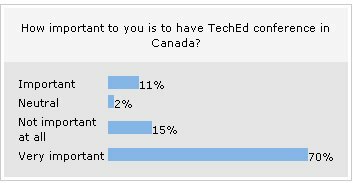 See you at Tech Ed, guys! Last night I spoke at the Metro Toronto .NET Users Group on Interop between J2EE and .NET apps, using a variety of techniques but especially Web Services. There was a bit of code, but really the emphasis was on philosophy, the kind of “big picture” approaches you can take to make interop happen. I mentioned more than once that it's important to know what exactly you mean by interop and what it is that you want your two (or three, or more) applications to be able to do together. The sorts of projects that really don't work are the ones that start “how can we use BizTalk in our firm?”. Start with a business problem, and if it looks like BizTalk will make it possible to solve the problem, then go from there, but don't pick the solution and then go looking for a problem. This came back around in the post-presentation questions and chat, and we got to talking about the importance of requirements. I'm hip deep in a project where we spent months just settling the requirements, but as a result the project has moved forward into code after spending years (before I came on board) getting about halfway through design and then stopping and starting over. For Enterprise work (and these interop issues are generally Enterprise) there is simply no substitute for real solid business requirements that are completely nailed down before anyone starts designing, followed by a properly thought through design. I don't go through all that for three day projects, putting together a little Sharepoint web part or some Windows Service that sends email at night about additions to the database today, but I sure go through it for anything that needs more than one programmer or that will take more than a month. I was reminded of a funny article I read a while back called Agile Bridge Building, which mocks Agile Software Development by dissing bridge design in favour of showing the client Working Wood as soon as possible. Basically, you stick a log out into the river and right away you've started to build your bridge. This process naturally produces requirements, since now we have consensus that the log should actually reach all the way to the other side of the river! Why waste a lot of time in meetings trying to develop this requirement in advance? Once there's working wood, a genuine prototype, the stakeholders can quickly agree on what's important. And all without the hassles of paying someone for requirements and design. There's more, so I recommend you read the whole article. And to be honest, if I lived in the woods and was sick of wading through a small stream to get to the far side of my property, I probably would apply Agile Bridge Building to the problem, just as I don't particularly design every speck of software I write. But I'm glad the folks who built the bridges I drove over today designed them first, and I'm glad I know how to gather requirements, get consensus on functionality, and design the big projects I code before I code them. Once again Fawcette have tapped a number of Toronto folks and given us not-so-secret discount codes for VSLive registrations. That's right, register for VSLive Toronto, enter KATE as your priority code (where it says "Please enter the first five digits of your conference priority code") and presto! you get 10% off. VSLive is April 13th to 16th, and there are early bird prices until March 16th. This year it's divided into ASP and Smart Client, and it's packed with Whidbey (aka 2005 or 2.0) material. The agenda is at http://www.ftponline.com/conferences/vslive/2005/to/agenda.aspx with session details at http://www.ftponline.com/conferences/vslive/2005/to/asp-sessions.aspx and http://www.ftponline.com/conferences/vslive/2005/to/smart-sessions.aspx. You'll see plenty of familiar names speaking, and there's sure to be more good stuff announced as we get closer to the date. So make your plans, and I'll see you there. Abstract: The enhancements to Visual C++ 2005 enable it to stand toe-to-toe with any tool in terms of support for the .NET Framework. In fact, in many ways it can do things no other tool can. Learn how the CLR brings new features such as garbage collection, generics, reflection, and verifiability to C++ ... and how C++ brings deterministic cleanup, templates, and meta programming to the CLR! Learn how to easily migrate existing native code - including MFC applications - to run under the CLR. Strategies for choosing which parts of the application remain native and which are managed will be discussed. Finally, this session will provide guidance on how to build high-performance managed "wrappers" enabling reuse of native libraries. Abstract: Whether you build end-to-end applications or components for enhancing larger applications, the new Visual C++ 2005 is the power tool for Windows programming. In this presentation we’ll spend extensive time in the Visual C++ 2005 development environment – highlighting new productivity features – as we dive into its support for building high-performance, first-class native and managed applications. You’ll learn about native code compiler optimizations, security enhancements, 64-bit development, and support for multiprocessor/grid computing systems. In addition, this presentation will demonstrate how Visual C++ 2005 now provides CLR/.NET Framework support that allows it to stand toe-to-toe with any other tool in terms of elegance and productivity…with the additional benefit of high-performance access to native code and the ability to easily move native code to the managed environment. You'll want to attend both, of course. Register now! As well, the Women In Technology lunch will be happening again and I'm looking forward to another panel appearance. This is shaping up to be another great Tech Ed... as long as some more familiar faces start to show up on the speakers list. Monday the 21st is the February meeting for the East of Toronto user group. Please visit http://gtaeast.torontoug.net/ug_events/936.aspx to register. This event will consist of an overview of methods for interoperating between Java-based systems and NET including XML document exchange, shared database, messaging, web services, and Java to .NET bridges. We’ll spend the bulk of the time on a detailed analysis of the approaches and methods for web services-based interop between apps and systems running on .NET and other technologies.